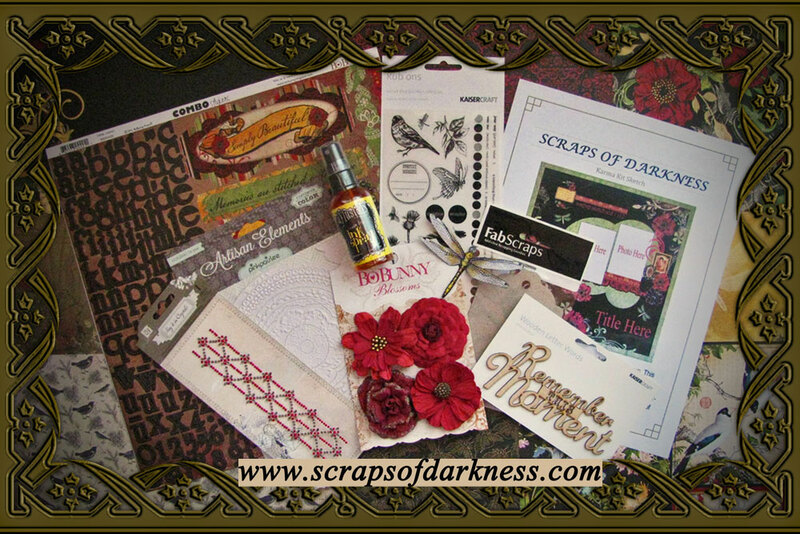 Scraps of Darkness and Scraps of Elegance: November Blog Hop and Kit Reveal! If you'd like to see the full kit and add ons, please visit our website or store. When you have visited everyone return here and leave us a comment letting us know how much fun you had! The winner will be announced on this blog on Monday November 19th. Gorgeous kit Mel! Thank you for giving us such amazing products and unique items to work with!! What a beautiful blog hop, gorgeous, gorgeous work from all the designers!!!!!!!! Already like you on facebook and have been a follower for a while... Will be posting on my blog.... Thanks for allowing me to hop with you guys!!!! Thanks to Melinda and all my dark sisters for such amazing inspiration each and every month. I am stalking the postie for my box of Karma!! Can't wait to get my hands on this gorgeous kit, and how cool to join in with Bo Bunny this month! there is so much gorgeous inspiration on this hop! You have so much talent in this hop. All the projects were simply amazing. Thanks so much for having this hop. I really enjoyed it. Thank you SO MUCH for all the fun. I saw so many wonderful projects! Had problem with commenting at Renea`s and Helena`s but will try again tomorrow. Regards! I loved it.. I put your hop on my blog and blasted it on FB everyone should see ya'll's work. These projects are amazing! Wow, I am blown away! Became a follower of the blog and FB both. Beautiful work... had a lot of fun hopping and seeing the wide variety of artistry on the SOD and SOE DT's! Thanks for the great hop and chance to win!!! Oh my goodness, I finished the hop and I can't believe how inspiring the projects were! I haven't been this excited about crafting in ages! The color, the texture, the artistic flair shown by your DT is fabulous! loved the hop. had a great time discovering new inspirations. thank you for the hop and a great teamup with BoBunny. OMG... I love this project and I just love the layouts that were made using it. So inspiring.. just linked on my blog. Thanks so much for a fabulous ride. Wow the team really went out on this bloghop! I liked on FB. I joined on Pin interest and I posted the bloghop on my blog http://mybeaner.blogspot.ca/ Thanks for a great morning! Wonderful layouts again for kits, tons of inspiration!!! I've completed the hop! I had a lot of fun and got tons of inspiration. You sure have a lot of great artists on your design team! I just finished the hop. I saw so much inspiration. Gorgeous projects! Thanks to Bo Bunny for letting me know about the hop and introducing me to your kits! Oh - I am now a follower... and loved Mandy's multiple layouts and altered art.